Is well known that Tango born here in the suburbs of Buenos Aires, and then, from the darkest brothels in town it traveled to the most fancy cabarets in Paris. 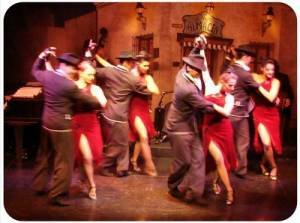 In the early 20th century the Tango was established whole around the world and was now a tempestuous but legal dance. That show was seen for every celebrity who visited Buenos Aires, included the King of Spain. The structure of a Tango show Buenos Aires will include two different styles of Tango: The Tango-to-floor and the Stage Tango, for doing the different rhythms the dancers will do. A live orchestra (usually a quartet or quintet, but you can see a fourteen members orchestra) plus at least two Tango singers will be part of the show. The seat options could include or not dinner, but in many places even the tickets for only show would include a glass of wine and free round transfer in a shuttle. The dinner is always a three steps menu with multiple options including vegetarian and celiac options, plus wine, beer, sodas and coffee. 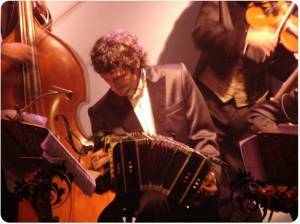 The Vip menu of the Tango show Buenos Aires improves the wine, broadens the menu, incorporate champagne and in many cases brings private car round transfers. In Tango show Buenos Aires we offer, you can get the private car transfer in included in the standard dinner ticket or the standard show ticket depending on the payment method.